We can all agree that it is much easier to communicate when everyone is using the same vocabulary and assigning the same meaning to the words we use. Websites are somewhat complicated and the design industry can be full of foreign sounding terminology which can be easy to confuse. I have outlined some of the most basic sections and what they are used for to help you sound like a pro when discussing website design. Headers are usually found at the very top of a web page. They will contain information such as the company logo, the website navigation, and possibly a phone number or the option to log in or create an account. Hero refers to the main area of focus on a web page and is most commonly found on the home page. (Internal pages can also have a hero.) In almost all cases, the hero area is used to show a headline, maybe some supporting text, and some sort of call to action. 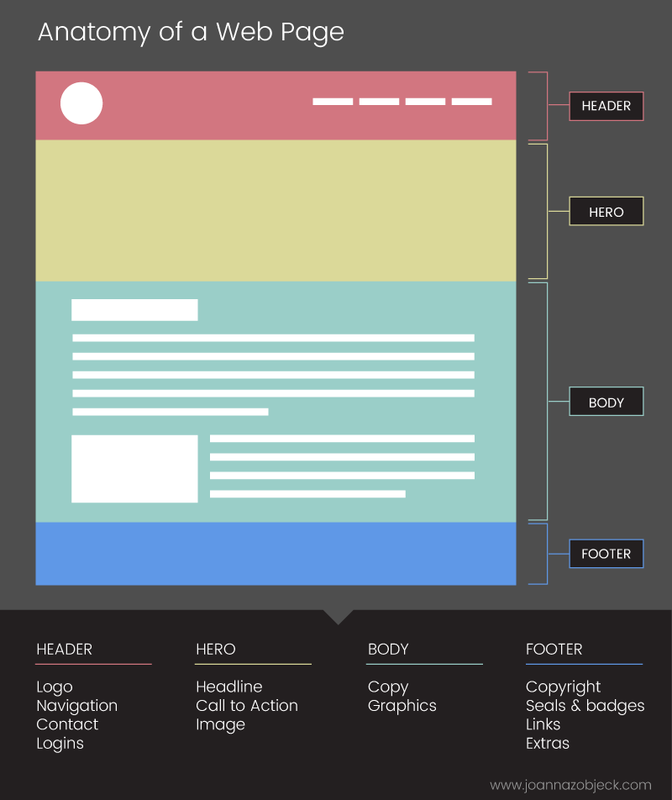 The body is where your website’s main content will be laid out. Any copy or images you have to help explain the purpose of your website or business will go here. Footers appear at the bottom of each webpage. They may contain information such as copyright, date of creation, additional contact information, and links to other pages in the website. This is also a good place to show any security seals or authenticity badges. Social media for the business page along with newsletter sign ups also fit in very well down here.